Don’t Play With Your News appears in a series of 3 projects, for which I collected & processed over 50,000 NPR news broadcasts. Read more about the series & its projects here: Breaking the News. Radio news is a monologue of authority. For those who experience it daily, the ritual of radio news has an oracular quality: an ethereal voice with an invisible speaker delivers statements about a world we cannot see from where we stand. An asymmetry of knowledge lowers our guard for seeking truth and prompts us to accept new conclusions. As we tune in to the news, its voice becomes inseparable from its authority. But what if the voice of this authority could bend and its relationship with the audience could be inverted? What if you could disarm this voice and play with it like a pile of magnets? Don’t Play With Your News invites such play with a puzzle game based on the radio voices of NPR News. Thousands of hourly news updates from the last 6 years have been cut into 1,148,916 clips, which can be searched & reconfigured in any imaginable way. 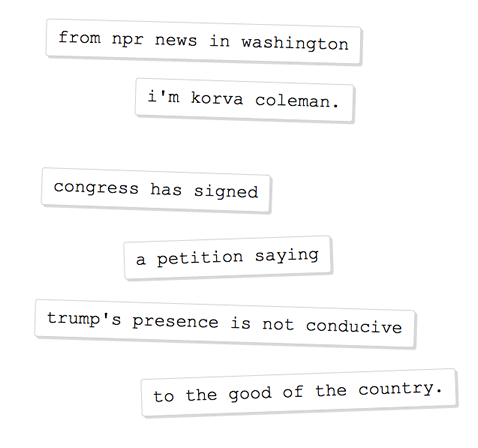 These puzzle pieces are available for 6 different voices of NPR News: Lakshmi Singh, Korva Coleman, Jack Speer, Giles Snyder, Barbara Klein, and Craig Windham. What creates truth in news? Is it the content, the voice, the ritual, or something else entirely? Don’t Play with Your News is based on NPR’s hourly news updates (it is not affiliated with NPR). Using speech recognition, speaker voice identification & natural language analysis, it automatically cuts the news into audio files of short phrases and finds plausible connections among them. Don’t Play With Your News is a project by Gregor Hochmuth and appears in a 3-part series that explores our relationship with the news & broadcast. Read more about the series & its projects here: Breaking the News. Sign up for announcements about future projects at grex.nyc/mailing-list.